Here’s a project I completed a few weeks back and it’s one I really enjoyed. 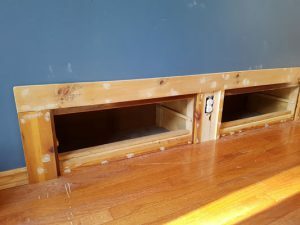 I enjoyed it for a number of reasons: it gives us more storage space in our fairly small bedroom, makes use of previously wasted space, and was completed with only things that I already had laying around the house and garage. 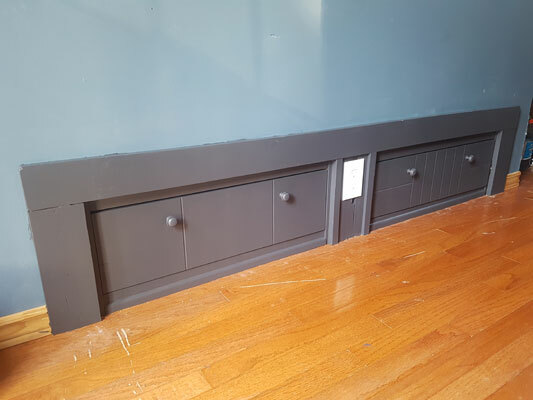 The project idea came about because I noticed that there was some unused space behind one of the walls of our bedroom. The bedroom is a couple of steps below the adjacent spare bedroom and below the closet in that bedroom I found some space about a foot and a half high and 8 feet long. 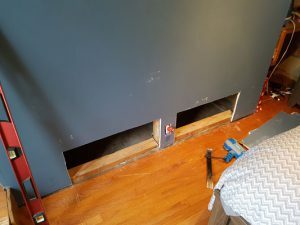 Fortunately I had access from behind in the basement to determine that there wasn’t anything in the way and I could figure out where the best places to cut the holes in the wall would be. Also, when we moved into this house there was an old dresser left behind that we didn’t really have any use for. Putting these 2 things together a project idea was born. Here’s the dresser with most of the drawers removed. 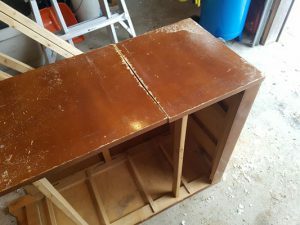 The next step was to cut the dresser apart. 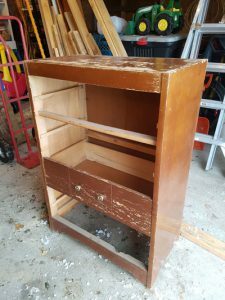 I used 2 of the drawers and the existing dresser structure (slides, top, sides etc.). After cutting everything apart some additional pieces needed to be added to make sure that the drawer slide structure wasn’t compromised. The next step was trimming out around the edges to provide a nice built-in look. 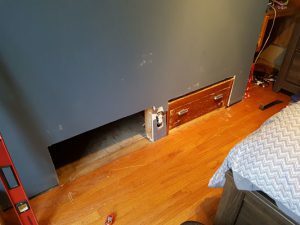 I had old door framing materials that I cut to size and installed using a nail gun. There was lots of patching to do with wood filler, as you can see, since I was using reclaimed materials. 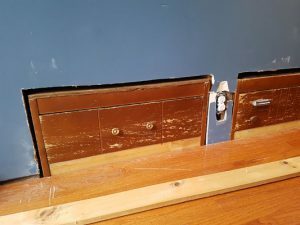 I also removed the existing drawer pulls because they weren’t all the same and filled the extra holes with wood filler. After sanding the trim the final step was to paint the drawers and the trim. Oh, I actually bought the paint for this, but I was planning to buy it anyway to refinish our outdoor bar stools, so I didn’t (really) lie about using only materials on hand! Here’s the final product! Yup, we’re talking curling here. The Brier is the men’s Canadian championship in curling and we’re right in the middle of it right now. Until I moved to Northern Ontario less than a decade ago I had no interest in the sport. Looking for something to do in the winter months in Thessalon I joined a curling team and quickly discovered the charm of this very Canadian of pastimes. Now during the winter you can find me watching curling on tv, playing in the weekly men’s league in Thessalon, and joining in bonspiels (curling tournaments) whenever possible. It wasn’t until I had played that I started taking an interest in watching the “pros” on tv. Getting out on the ice yourself you discover just how long that sheet of ice is and how difficult it is to make the shots that those more experienced make look easy. I’m also not really a “sports guy” – I don’t really watch any other sports much on tv. But curling is a bit different. The majority of the “pros” in Canada have other jobs – curling isn’t a career like NHL hockey player or golfer. There is money in it, but not enough to sustain the average person’s lifestyle. This makes it more “real” to me and is part of what makes it so easy to support. Playing curling is different than other sports too. It is a sport of graciousness and sportsmanship taken to a higher level. Games always start with a handshake and “good curling” with the opposing team members. If the game is nearing the end and it is unlikely that one team could catch up then they shake hands and concede the game – before the technical end of the game. Now if I happen to catch a hockey game it seems ridiculous watching the underdog continue to try to score when they’re down 5 goals and there’s 2 minutes left in the game. Imagine if they just shook hands and conceded the game! That is class. And at the end of the curling match it is tradition to sit down with your opponents, enjoy a beverage and spend some time together. From what I hear this happens even at the top levels of curling competition. The community aspect of the sport is as much a part of the game as what happens on the ice. The other great thing about curling is that people of all ages can enjoy playing the game. Delivering of rocks can now be done using a “stick” so that the player doesn’t have to get down in the hack, avoiding all that bending and getting back up off the ice. In our club we have people in their late eighties still getting out and playing each week. Curling is a community activity that provides all sorts of benefits to the members of that community. I’m glad I discovered this, even if it came a bit later in life! Andrew and I recently tried Swingbridge, a beer crafted by the Manitoulin Brewing Company. I love the fact that this is a Northern Ontario made beer and is semi-local to our area. So far it looks like Swingbeer is the only beer brewed by the Manitoulin Brewing Company but based on the taste of this one I hope they venture into other offerings. 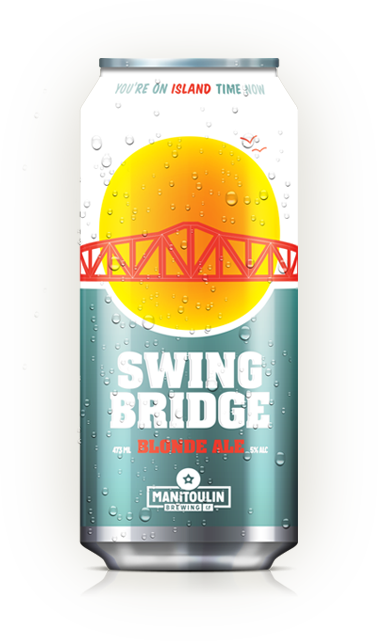 Swingbridge is a blonde ale and poured a hazy yellow colour with a small amount of white head that stuck around for awhile. This had a maltier edge to it that then most blonde ales which was a nice surprise. The malt is well balanced with hops that have enough flavour to be noticeable while still being subtle enough to be enjoyable. Smooth drinking, well balanced, and full of flavour this one was a huge win in the local beer category. Andrew and I recently got around to trying a couple of different selections from one of the local breweries. 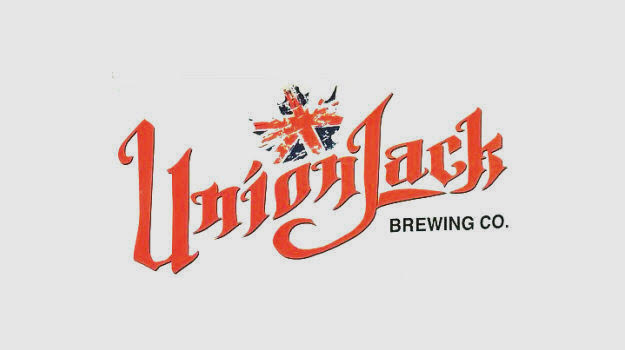 The Union Jack Brewing Company opened in May 2015. Initially their beers were only available in-house but they just recently managed to get their beers into the Beer Store. A number of local restaurants also offer their beer on tap. The first Union Jack Beer I tried was a tall can of their Algoma Pale Ale. Given my love of IPA style beers I was excited to try this selection though a bit leery given how many overwhelmingly hoppy beers have been labeled as IPAs recently. Thankfully this wasn’t a beat you over the head with hops situation – the Algoma Pale Ale was well balanced with notes of hopes, malt, and subtle pine. I really enjoyed this selection and it would be something I would definitely pick up again. Andrew and I both tried this selection on draught at a local restaurant. Though described in the style of an American pale ale, this felt more like a traditional amber selection to me. I’ve really been enjoying the complexity but smoothness of amber ales recently and this was a good example of something simple but tasty. Malty undertones and little to no hop taste. Only Andrew has tried this one so far (okay, I stole a sip of his beer but not enough to comment on it). It was a number of weeks ago that he had this particular beer – but remembers liking it if nothing else. I figure that just means we have to try it again to confirm that it was good. One of my favourite parts about having a garden (other than eating the delicious veggies) is sharing produce and talking about gardening with other people. I love the idea of trading vegetables, sharing bountiful produce, and having a gardening community. Within our local family and friends we try to share plentiful produce. This summer we’ve been treated with cucumbers from Andrew’s parents garden – they had far more than they could eat. We plan to share some of our garlic with local and far away family members. I also enjoy cooking and sharing meals that were made out of food we grew. There is nothing more satisfying than eating a meal that you cooked from scratch and that contains the food you laboured over. Those meals are true works of love — even if the occasional dish ends up being a creative failure. Some of the best gardening tips and advice I’ve received have been from other local gardeners. I have tendency to want to read a lot before starting a project. There are a ton of gardening books and blogs out there and beginning to read about a topic like vertical gardening can be a bit like venturing down a rabbit hole. Which is great but sometimes it’s hard to find suggestions of what will work in our specific climate and soil quirks. Even locally there is a lot of variation in soil, but local success stories are heartening and highlight the ability to grow such a range of produce in the North. Where do you turn for gardening advice? Who is your gardening guru? This is the second post in the Living Local Series. The first post in this series featured Outspoken Brewing and can be found here. Shabby Motley is a yarn shop, cafe, and funky hangout out space on Queen Street. Coincidentally it is located right next door to Outspoken Brewery, which I wrote about a few weeks ago. The store is filled to the brim with every type of fiber and yarn a crafter could ask for. But, given how crazy long it’s taken me to approach completion of my latest knitting project I haven’t indulged in too many of the beautiful yarns offered by Shabby. My goal is to finish using up some of the yarn I already own before I stockpile more. But, even if you aren’t a knitter or fiber artist Shabby Motley is a pretty neat space. 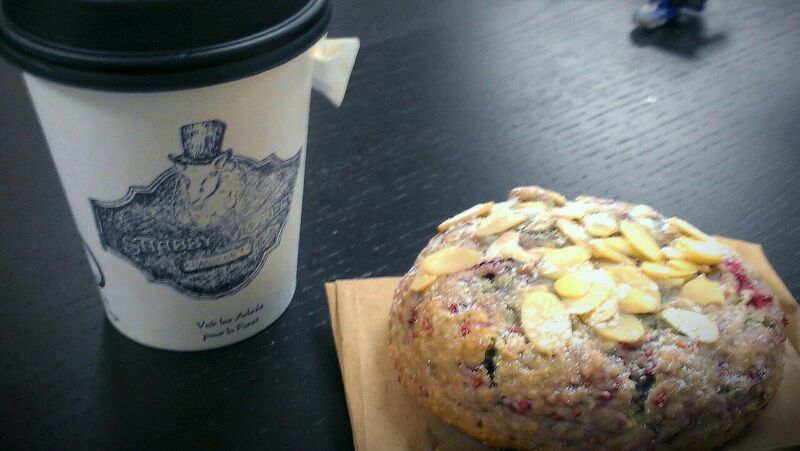 They have delicious baking, locally roasted coffee from St. Joseph Island Coffee Roasters, and delicious sandwiches. The staff are super friendly and helpful. It’s an inviting space that makes me want to knit more every time I visit the shop. The shop’s facebook account is also pretty awesome and hilarious at times — and they are constantly posting inciting photographs of tasty treats. I am very happy to see a local business like Shabby thriving in Sault Ste Marie’s downtown core. Definitely a local gem. I love finding local places that are unique, offer a great product, and owned by friendly people. I think supporting local businesses and your local economy is important. The “Living Local” series is inspired by this affection for local places and local products. The series will highlight some of my favourite haunts, tasty eats, and miscellaneous local goodness. If you hadn’t already guessed Andrew and I are beer drinkers. We recently sampled two beers from OutSpoken Brewing a microbrewery that recently opened in Sault Ste Marie. Outspoken currently has limited storefront hours and sells by the growler and howler. Your first growler is $20 and refills are $12-13. We picked up two growlers from OutSpoken, one of Anvil Red Ale and one of Rabbit’s Foot IPA. Surprisingly I enjoyed the Anvil Red Ale more than the IPA. It was subtle, smooth drinking, and a lovely amber colour. Andrew and I are looking forward to trying more selections from Outspoken — especially since they recently introduced expanded hours.